Tea Forte®, the Global Luxury Tea Brand, represents the ultimate in artisan-crafted teas. Brew authentic loose leaf tea in Tea Forte®, the Global Luxury Tea Brand, represents the ultimate in artisan-crafted teas. Brew authentic loose leaf tea in a deliciously simple way with the Kati® tea brewing system. Oprah's "The O List" Favorite Things Edition says "This tumbler and infuser kit makes brewing my loose-leaf varieties a cinch." 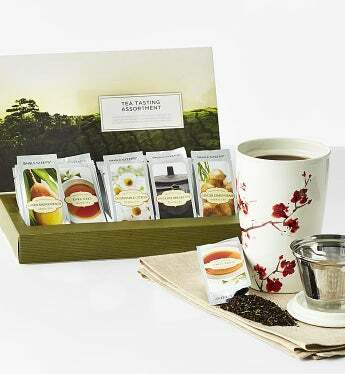 Includes a ceramic cherry blossom tumbler with integrated stainless steel infuser, ceramic lid, and a gift box of 15 Single Steeps® pre-portioned pouches of extraordinary loose leaf tea in five pleasing flavors. Truly a wonderful taste experience! Simply place the infuser on the edge of the ceramic tumbler, tear open a tea pouch, pour the tea into the infusing basket and pour hot water over the tea. Steeps a generous 12 oz cup of tea. Certified USDA Organic. Earl Grey Black Tea A timeless expression of robust Assam and bergamot. Green Mango Peach Green Tea The sweetness of ripe fruit, sharpened by peppermint and ginger. Ginger Lemongrass Herbal Tea Citrus notes balanced by cool spearmint and mellow licorice. English Breakfast Black Tea Referred to as the “champagne of teas”, this sought-after Darjeeling from the esteemed Monteviot Estate is prized for its delicate flavor and aroma. A bright and floral cup accentuated by natural fruity nuances. Kati® Ceramic Tumbler with innovative double wall construction that keeps tea hot and tumbler cozy to hold! Tea Forte®, the Global Luxury Tea Brand, represents the ultimate in artisan-crafted teas. Brew authentic loose leaf tea in a deliciously simple way with the Kati® tea brewing system. Oprah's "The O List" Favorite Things Edition says "This tumbler and infuser kit makes brewing my loose-leaf varieties a cinch." Includes a ceramic cherry blossom tumbler with integrated stainless steel infuser, ceramic lid, and a gift box of 15 Single Steeps® pre-portioned pouches of extraordinary loose leaf tea in five pleasing flavors. Truly a wonderful taste experience!